Tomatoes are among the softest food ingredients that are commonly used in many recipes. Because of this, you should be careful in cutting tomatoes – especially when you need them in a particular shape or design. Tomatoes are good for one’s health. It makes for a pretty and nutritious food decoration. A tomato slicer is able to produce presentable pieces of sliced tomatoes without much effort. This type of tool will help you make clean cuts of tomatoes instead of smashing them while in the process of slicing. 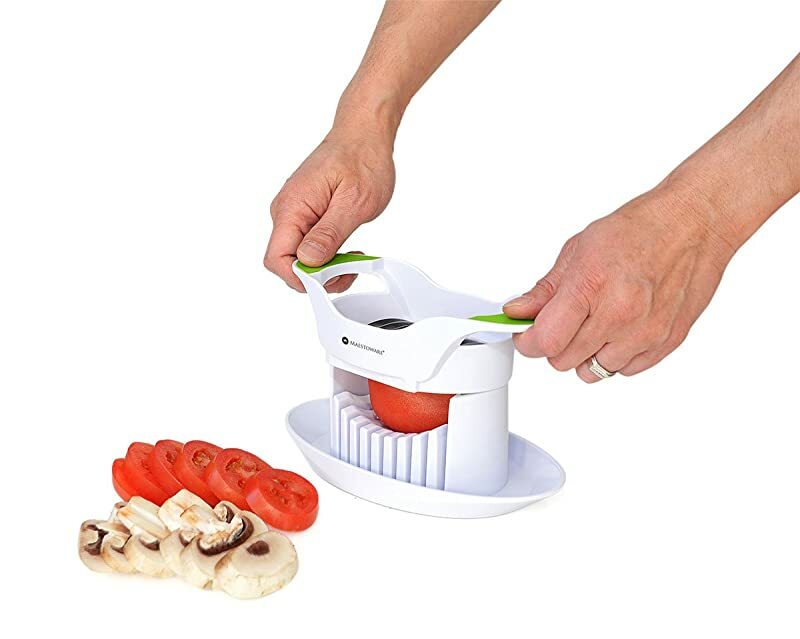 A multifunctional tomato slicer can also help you prepare other types of food. Which is the Best Tomato Slicer for You? You can quickly produce a lot of tomato slices. The cuts will be more uniform and consistent in size than if you were to slice the tomatoes the old-fashioned way. When using tomatoes in dishes, it would be better if the pieces are of the same size (for even cooking). Easy to set up – It should not be a hassle to put together. Effective and efficient – It should be able to produce clean cuts of tomatoes instead of smashed ones. Simple to use – Choose a model with a simple design to make sure that you can use it properly. Easy to clean – Tomatoes can be messy – therefore, having a unit that’s easy to clean will make the whole process more enjoyable. Versatile – It would be really helpful if you can also use your tomato slicer to cut other types of food as well. Before making that final decision on which tomato slicer to buy, consider the points listed below. Adjustable – You might want to get a model with adjustable thickness settings for your recipes. 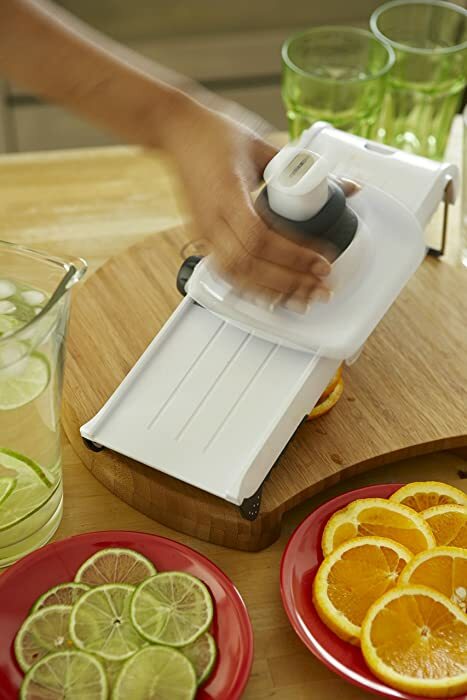 Safety features – Slicing devices will expose your hands and fingers to sharp blades. It would be wise to go for a model with added safety features. Safe materials – Look for a tomato slicer that uses chemical-free materials as this will come into direct contact with your food. Practical to use – Choose a model that you can use all the time and with other types of food. Here’s a set of tomato slicer that’s comprised of 2 items – a tomato holder and a knife. The tomato holder is made of durable plastic and it’s designed with a stand to hold the tomato up while you’re slicing through it with a knife. To use, simply position the tomato inside the holder. Using the slots as guide, you can then slice through the tomato in uniform sizes. Because of its design, you can also use it to slice other types of food (soft ingredients only) like onions and hardboiled eggs. With its simple style and direction for use, this model is safe as you can keep your hands and fingers away from the blade of the knife as you’re using it. The materials used in this model’s construction are also safe to come into contact with food. Easy to use – After placing the tomato inside the clamp, turn it upside down. You then need to hold onto the base of the unit to keep it stable while slicing through the slots. Set of clamp and knife – Although you can use any type of knife with the tomato holder, a matching knife is included in the package. High quality construction – It’s made of hard, durable plastic materials. Uniform slicing – The slots serve as your guide in making equal sizes of cuts. 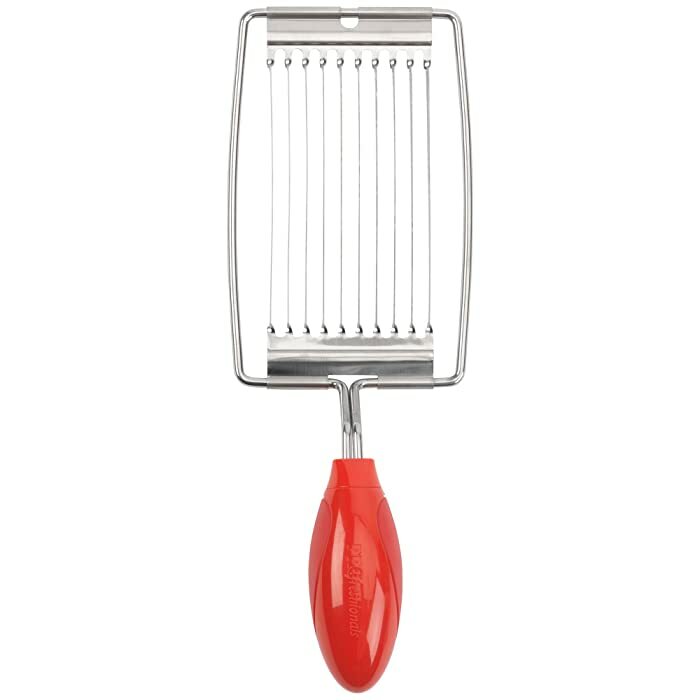 Easy to clean – This model of tomato slicer is dishwasher safe (top rack). Can’t adjust thickness – This is just a simple tomato slicer and it’s designed with slot guides that can’t be adjusted. However, you have the option of skipping a slot if you want to make thicker slices of tomatoes. Solid color – Having one color all throughout the tomato holder makes the slots a little difficult to see. The Joie Tomato Slicer & Knife package is useful in cutting small and big tomatoes whether they’re firm or soft. In spite of its simple design, it can effectively hold a piece of tomato so that you can make clean cuts easily. This model functions as a tomato and onion slicer – that’s why it’s really useful. 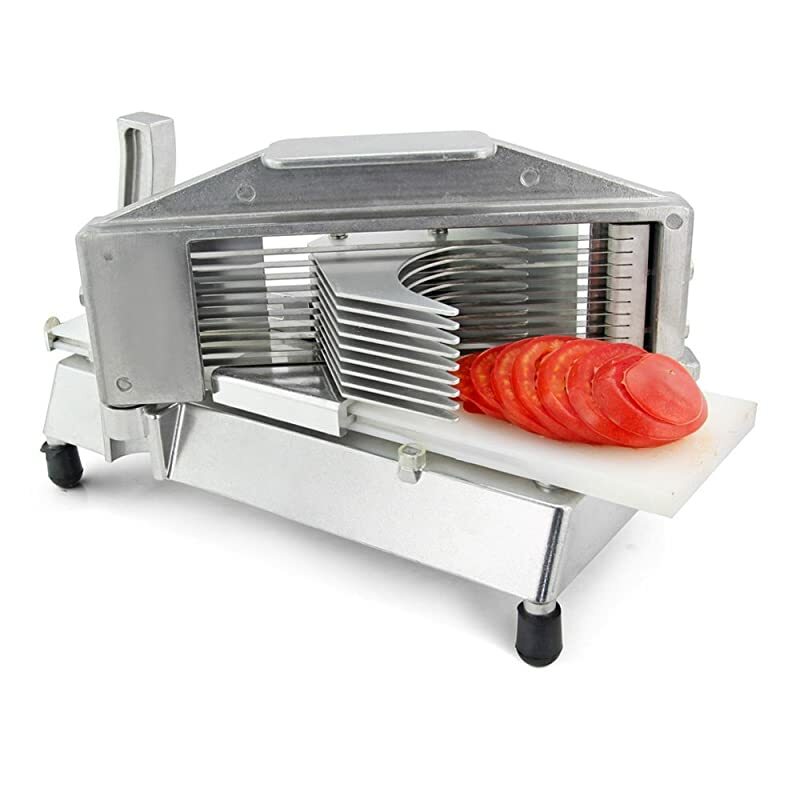 The Zyliss tomato slicer is a mandoline device model. It comes with blade inserts that can produce different slices of tomatoes according to your needs. Slicing is done by sliding the food along the unit’s surface using a food holder. Designed with built-in rails along the sides, your hand will be guided all throughout the slicing procedure. Having a nonslip design makes the unit safe and easy to use as well. With this very simple device, you can make tomato slices in different sizes. The blades are sharp to make clean cuts, but come with built-in handles to keep your hand safe when changing the blades. To clean, you can easily disassemble the unit and wash the parts. Storage is easy, too, as it can be folded. Safety rail system – Having a guide makes it easy to control and slice food on the unit. Adjustable settings – You can make very thin and ultra-thick slices of tomatoes. Professional-looking slices – You can make uniform sizes of tomatoes with this unit. Fast results – Using it can help you slice a lot of tomatoes quickly and safely. Safe to use – The package includes a food holder to make sure that the blades are always away from your hands and fingers. Plastic materials – The plastic surface is not stain resistant and can easily get discolored with constant use. Small food – You can use this model for small-sized tomatoes and other types of small food. This multifunctional mandoline can be used for slicing tomatoes and other types of fruits and vegetables (cucumbers, hardboiled eggs, carrots, etc.). Having a nonslip base makes it safe and easy to use, too. Here’s model of handheld tomato slicer that’s simple and easy to use. To operate, place the base of the slicer on a flat surface and position the tomato on top of it. You then need to use the slicing piece of device to cut the tomato by pressing it down on the food. Made of ABS plastic, its construction is solidly built – and the unit itself is made to be durable and hard. As for the blades, these are made of stainless steel. Because of the single action needed in slicing a whole tomato, you can slice a lot of tomatoes in a short time with this device. Safe design – Your hands and fingers are positioned away from the sharp blades when cutting tomatoes. Food-safe – It’s made of BPA-free plastic materials. Comfortable to use – Although you need to apply some pressure on the slicer, the grips are made to be easy on the hands. Stable – It comes with a wide base and won’t wobble and shake during use. Easy to clean – Hand washing is advisable and there are no crevices where food can get trapped. Not adjustable – It comes with preset blades that can’t be adjusted to make different sizes of tomatoes. For soft food only – Although this is a multifunctional food slicer, it’s not designed to handle tough types of food. The Maestoware Soft Vegetable and Tomato Slicer may not be a commercial model, but it can make quick cuts effectively. Just keep in mind that it’s still made of plastic – and is, therefore, not as durable as those that are made of metal and aluminum. Still, you can use this versatile piece of slicer for other types of soft food like strawberries, onions, hardboiled eggs, etc. Designed with several serrated blades, this model of tomato slicer can cut a whole tomato quickly. Its operation is very similar to using a knife – but since it comes with a lot of blades, you can slice through a whole tomato by simply using a sawing motion. Since it comes with an ergonomically designed handle, you can grip on the handle and slice through a tomato easily. The unit is also lightweight to make the act of slicing food truly trouble-free. Uniform slices – The blades are preset and can deliver even sizes of cuts. Fast operation – This model is designed to slice through a whole tomato quickly. 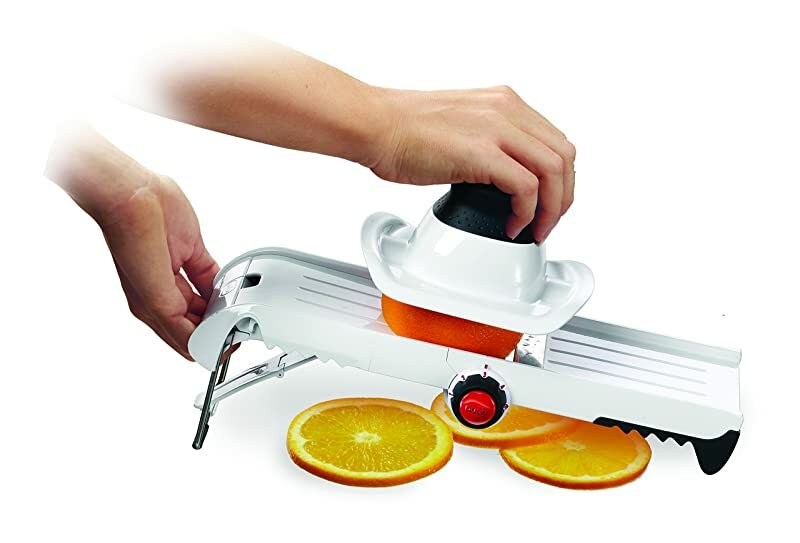 Comfortable handle – You can securely hold onto the slicer. Quality – It’s built to last for a long time. Sharp blades – You can slice tomatoes with minimal energy and effort. 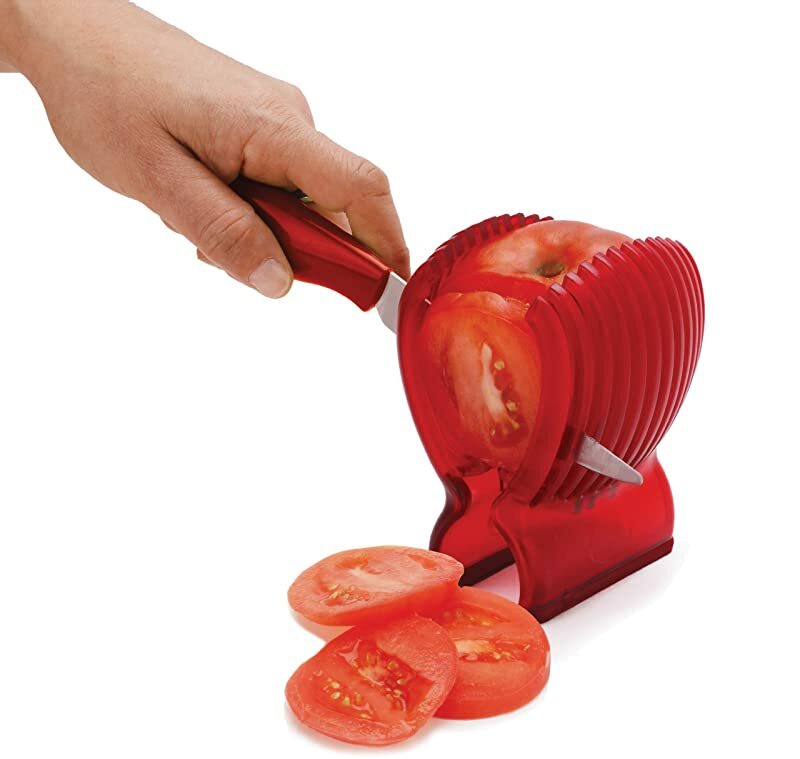 Awkward operation – To use this slicer, you need to hold on to the tomato itself – which exposes your fingers to the blades. No handguard – The package doesn’t include a handguard or a food holder. While this is an effective tomato slicer, it’s not that safe to use as your hands are exposed to the blades during the cutting procedure. Should you decide to go for this model, I would suggest buying a food grade kitchen gloves when slicing tomatoes and other types of food. If you’re looking for a commercial tomato slicer, you can look into the New Star 39696. It comes with aluminum frame and stainless steel blades for maximum cutting action when intending to make a lot of sliced tomatoes quickly. Its overall design includes a built-in cutting board as well as a built-in pushing mechanism to automatically slice a whole piece of tomatoes instantly. This model is also an all-around food cutter – but it’s only recommended for use on soft types of food. Easy to clean – The pieces can be taken apart when you need to clean the device. Fast slicing action – With just one push, a whole tomato can be sliced into many pieces. Efficient – It can produce nice, even slices of tomatoes. Nice build and quality – This model is not made of plastic, but of aluminum materials. Commercial design – It’s for commercial use and can therefore handle the demanding job of slicing A LOT of tomatoes in a day. Design flaw – The open cutting board design can sometimes result in pieces of tomatoes flying off the board. Limited size – It can only handle small to medium sized tomatoes. If you use tomatoes a lot, this commercial model can be a good option for you (even if you only need one for home use). 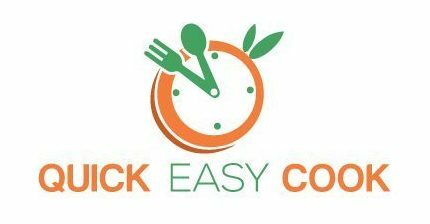 It’s designed to quickly slice a whole piece of tomato in one setting and can also be used for other types of soft food (e.g. mushrooms, eggs, etc.). The best tomato slicer for you is the model that’s most suitable to your needs. If you only need a simple device that can help you slice tomatoes safely, I recommend the Joie Tomato slicer and knife package. It’s very affordable, simple to use, easy to clean, and easy to store as well. For a commercial model that can also be used at home, the New Star 39696 Commercial Tomato Slicer would make for a good choice. It’s more effortless to use than units for home use and can quickly provide you with sliced tomatoes by just pushing on the slicing mechanism. It’s quite expensive, but it’s built for professional-use and can handle demanding slicing jobs. Of all the products in the Top 5 list, I recommend the PROfreshionals tomato slicer the least – mainly because of its design. Since you will need to hold onto the tomato while you’re slicing it, this exposes you to injury. So, while it actually works as a tomato slicer, the risk of cutting yourself accidentally is just too great. Do let me know if this post has been helpful to you by leaving a comment below. You can also share the article with your friends so that they can benefit from it, too.